If you have never had these wonderful potatoes, you really MUST try them! I was always a lover of AuGratin Potatoes, until I found these!!!! What does Dauphinoise really mean? Definition: In the culinary arts, the word Dauphinoise refers to a French recipe for potatoes in which the potatoes are sliced, layered in a baking dish and then baked au gratin with garlic, butter and cream. 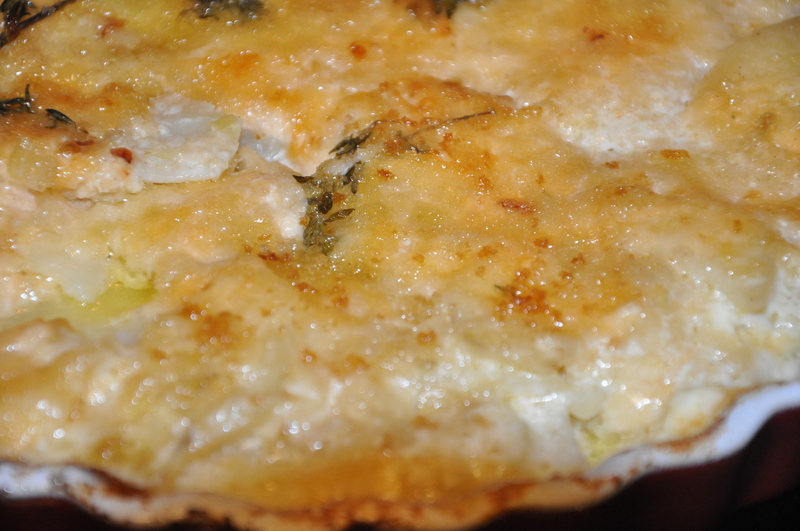 Variations on the Potatoes Dauphinoise recipe can include eggs and cheese. The name Dauphinoise comes from the Dauphiné region of France, where the Potatoes Dauphinoise recipe is said to originate. Although the names are similar, Potatoes Dauphinoise is not the same recipe as dauphine potatoes, which are balls of puréed potatoes mixed with choux pastry which are then deep-fried until light and crispy. Water so clear the Peabody duck will swim in it! The secret to the success of these potatoes is to slice them very very thin, and rinse your sliced potatoes until the water is clear (this removes most of the potato starch). 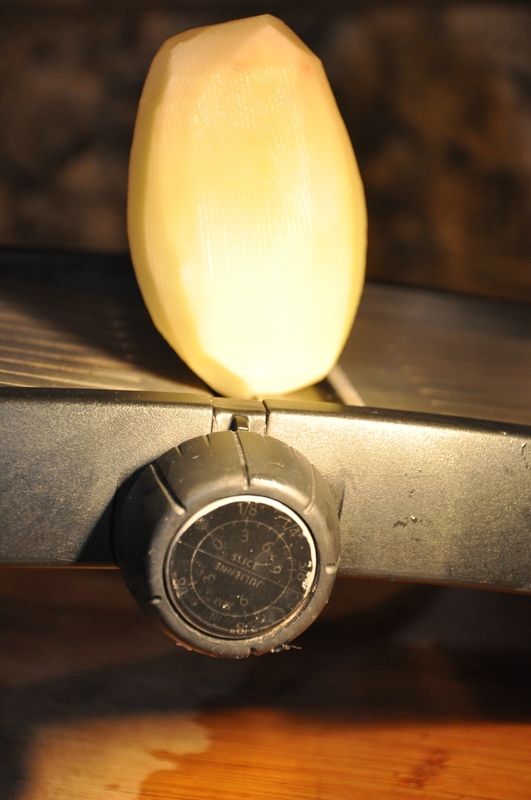 If you have a Mandolin Kitchen Slicer, you are all set. You will need 3-4 potatoes (I used russet), heavy cream, fresh thyme, white pepper, shallot, garlic (if desired), gruyere cheese, (I also like a little provolone), and pankos for a real crispy topping. 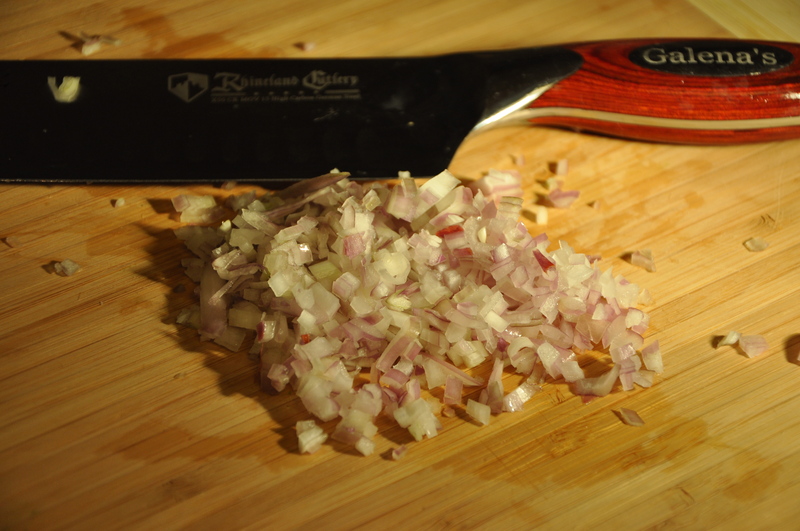 You will need to finely chop a ½ large shallot or 1 small shallot. Heat a small sauce pan with 1 tablespoon of butter, and when melted, add the chopped shallot, minced garlic (if desired) and a couple of stems of fresh thyme. Cook until soft (about 5 minutes). Add 1/2 cup heavy cream and heat until warm (do not boil). While your shallots are cooking (low and slow), you will need to slice the potatoes and place them in a single layer, overlapping each other in a circular motion. Butter, shallots, white pepper and fresh thyme. Place a handful of shredded gruyere cheese over potatoes (and any other cheese you like). Continue layering potatoes and cheese, ending with the potatoes. Top with a couple of tablespoons of pankos. Pour the cream mixture over the potatoes. Cover with foil and bake at 325 degrees 60 minutes. 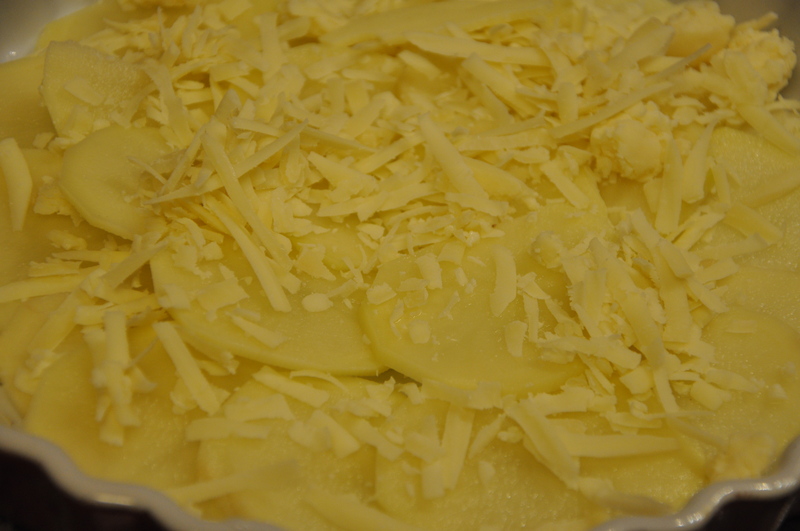 Remove foil and continue baking until top is bubbling and slightly golden. Heat a small sauté pan over medium low heat, add butter. 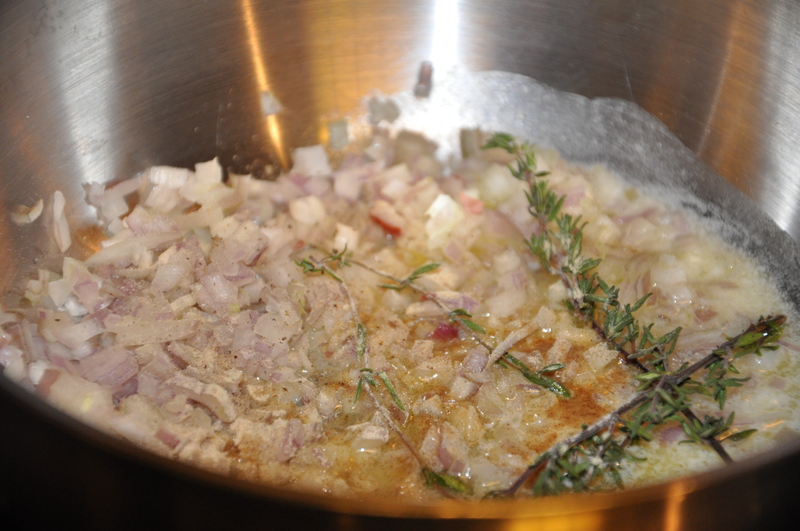 When butter is melted and bubbling, add chopped shallots, fresh thyme, and white pepper. Sauté until shallots are soft, about 5-8 minutes. Add the heavy cream to the pan and heat until warm, do not boil. While shallots are cooking, rub the remaining 1 tablespoon of butter in a gratin dish or round baking pan, and rub with garlic, if desired. 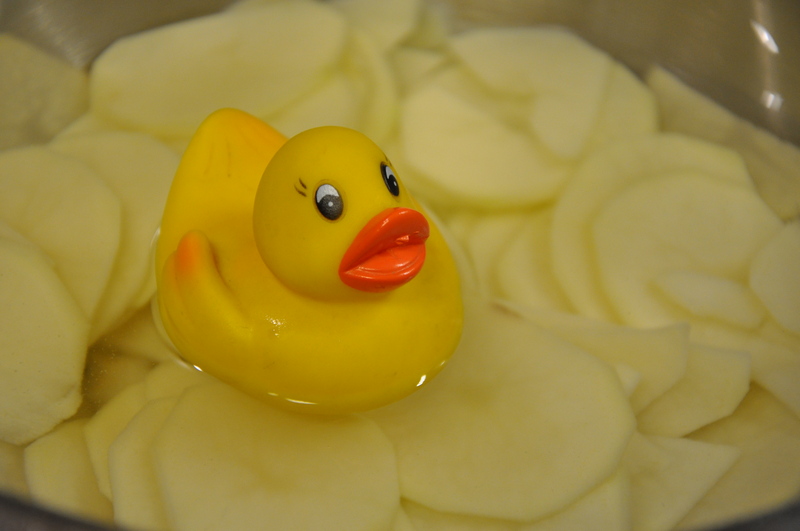 Line the bottom of the dish with a single layer of potatoes, overlapping each other. Sprinkle ⅓ of the shredded cheese over potatoes and ⅓ of the provolone cheese. 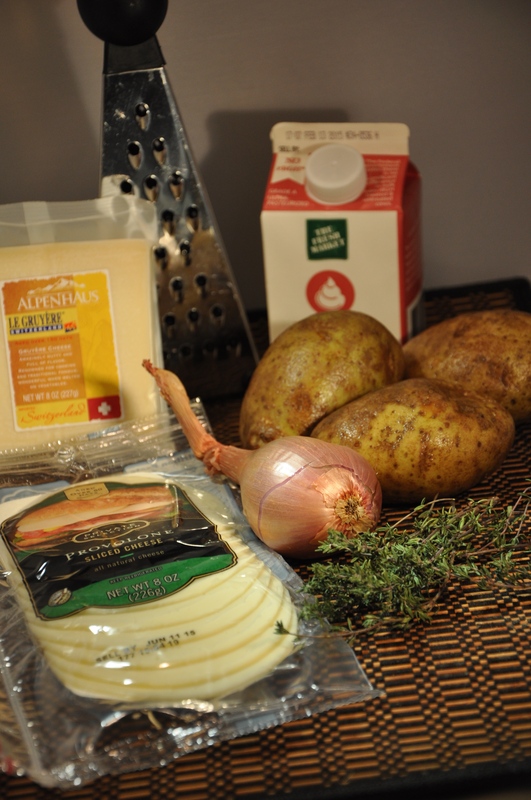 Continue layering potatoes and cheese; this should make 3 layers. Pour the warm cream mixture over top of potatoes, do not worry about the stems of the thyme, you can remove them after baking. Top mixture with Pankos and cover with aluminum foil. Place potatoes in preheated oven and bake 1 hour, or until potatoes are soft. Remove foil and continue baking until potatoes are golden and bubbly, about 10-15 minutes.